Sukhothai and Phitsanulok are two of the most remarkable historic towns in Thailand, though significantly less visited than the big tourist hot spots or even Ayutthaya. I was glad I made the trip some 400 km north from Bangkok last month and could experience these highlights in the lower north of Thailand in peace and without hectic. So here are your best options on how to get from Bangkok to Sukhothai and Phitsanulok. This is the best way to travel between these two cities overland. There are air-con busses leaving from the Northern Bus Terminal in Bangkok every 30 minutes, daily from 7am to 11pm. To get to the bus terminal, take the MRT underground to Kamphaeng Phet Station and from there a motorbike taxi (30 Baht) to Mo Chit Bus Terminal. Bus fares are: 273 Baht for 2nd class aircon, 349 Baht for 1st class and 407 Baht for VIP. The journey takes about 6-7 hours. 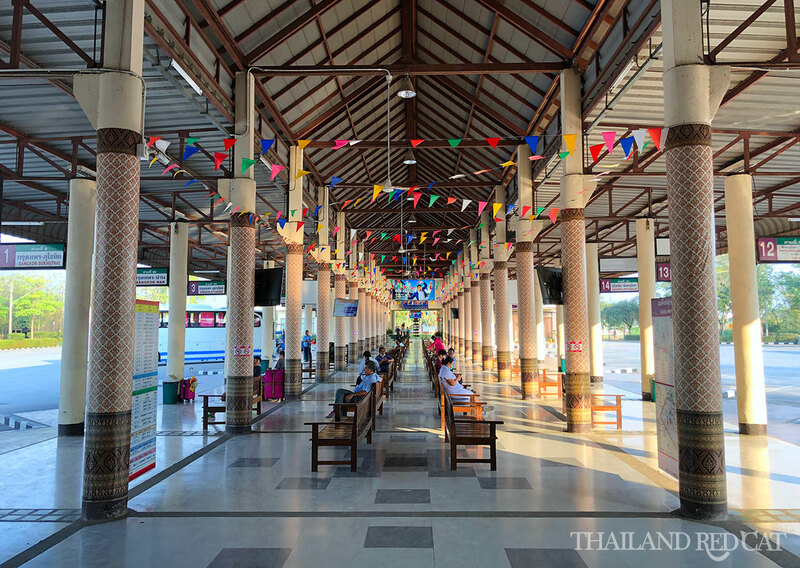 Once you arrive at the Sukhothai Bus Terminal (see picture below) there are songthaews (shared pick-up taxis) taking you to the foreign hotel area in New Sukhothai which is located about 2.5 km drive from the bus station. One way fare: 50 Baht. They also drop you off right at the door of your hotel if you ask them to with no additional charge. Taking the bus back to Bangkok works the same way: songthaew to the bus terminal, then bus to Bangkok – similar departure times and same fares. Note though that the bus trip back usually takes about one hour longer as you are likely to hit BKK’s rush hour traffic jam in the afternoon / evening. There is no train station in Sukhothai. If you still want to take the train as close to Sukhothai as you can, I recommend traveling to Phitsanulok (5 hours) and take the bus from there to Sukhothai (1 hour), see below. Sukhothai airport is located about 40 km north of New Sukhothai. There is only one airline which owns the airport and has two daily flights to and from Bangkok: Bangkok Airways. The one way fare is from 2,000 Baht and the flight takes about 70 minutes. Once reached the beautiful tropical architecture designed small airport, Bangkok Airways offers transport to New Sukhothai, 30 mins, 120 Baht one way. 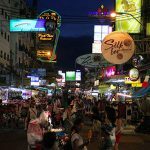 Since Phitsanulok is the main transportation hub between Bangkok and Chiang Mai, connections between these cities are frequent and excellent. There are buses leaving from Bangkok’s Northern Bus Terminal (Mo Chit) daily from 7am to 11:30pm. The trip takes about six hours and the fare is 240 Baht for 2nd class air-con and 297 Baht for 1st class. There is also one VIP bus service, leaving Bangkok daily at 11:30pm (347 Baht). At the bus station in Phitsanulok there are motorbike taxi and tuk tuk services to the town center, 4km, 50 Baht one way. Alternatively, hop on public bus no. 10 which takes you there as well (fan 8 Baht, air-con 11 Baht). This is how I traveled from Bangkok to Phitsanulok last month. 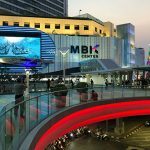 I think it’s the most convenient way as you don’t encounter traffic jams, have a more relaxed travel experience compared to going by bus and you also don’t have to make your way out to Mo Chit Bus Terminal which is at least 45 mins from Sukhumvit, Bangkok. Instead, just take the MRT to Hua Lamphong station (last stop on the line) and you are right at Bangkok’s main railway station of the same name. There are about nine different train services from Bangkok to Phitsanulok. Most popular are the three daily air-con 2nd class “Special Express Trains” departing BKK at 8:30am, 10:50am and 7:20pm (479 Baht). 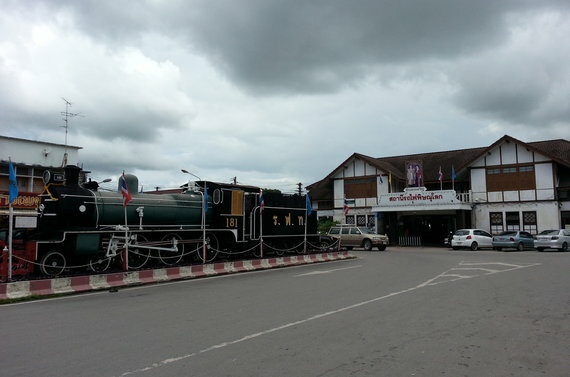 That’s your fastest travel option, these trains take 5 hours and 10 mins, however mine reached Phtisanulok Railway Station (see picture below) about 30 mins late – there are about 10 stops on the way. Other train services from Hua Lamphong Bangkok to Phitsanulok are: Rapid trains, 5x daily (5:50am, 7:00am, 2:30pm, 7:50pm and 8:10pm, seven hours, 3rd class 219 Baht, 2nd class 219 Baht) and sleeper trains, 1x daily (7:35pm, six hours, 1st class 1064 Baht, 2nd class 629-699 Baht). Nok Air has five daily flights between Bangkok (Don Mueang) and Phitsanulok. One way tickets from 2,300 Baht though there are frequent promotions for under 1,000 Baht. AirAsia operates two daily flights between Bangkok (Don Mueang) and Phitsanulok (and vice versa). One way tickets from 2,000 Baht. The flight with either airline takes about 55 minutes. Phitsanulok Airport is located just about 7km south of the town center. This is the only way to get from Phitsanulok to Sukhothai. There are fequent bus services from Phitsanulok’s Baw Khaw Saw bus terminal (see picture below), located 4km east of the town center off Highway 12. The buses to Sukhothai leave every hour, from 5:40am to 6pm, take about one hour and the one way fare is 28-55 Baht, depending on the type of coach. Now that you know how to get to these towns, check out my posts on how to make the most of your stay in Sukhothai and Phitsanulok. I was wondering if I need to buy tickets in advance if i’m traveling from Bangkok to Phitsanulok? or do I just buy tickets at the railway station when I’m there? Do tickets get sold out fast? Don’t worry Linh, no need to prebook unless you want a certain seat. There are always more than enough services available at any time of the year. Just dropping by and saying thank you for he information. Very well written. Im planning of going to Sukhothai this songkran by train, but will take bus instead. Researching travelling around Thailand (specifically BKK to Pitsanulok) and found your site on google. Thank you for the information. Very useful and well written. I am from Vietnam and will travel to Thailand for Loi Krathong in Nov 2015. I may have many question for you and hope you can spend your time to help. I will fly to Chiang Mai and then travel south. 1. Are there buses from Sukhothai Historical Park to Phitsanulok? Or just buses from New Sukhothai? 2. Are there good bus from Sukhothai to Lop Buri? Or I have to go from Phitsanulok to Lop Buri? Train or bus is better or easier to catch for this route? I leave near the train station in Lop Buri. 3. Do you know the best place to see sun flower fields in or near Lopburi? Have you got a particular address? 4. How can I buy train ticket in advance, from outside Thailand? I am afraid during Loi Krathong, aslo many tourists. 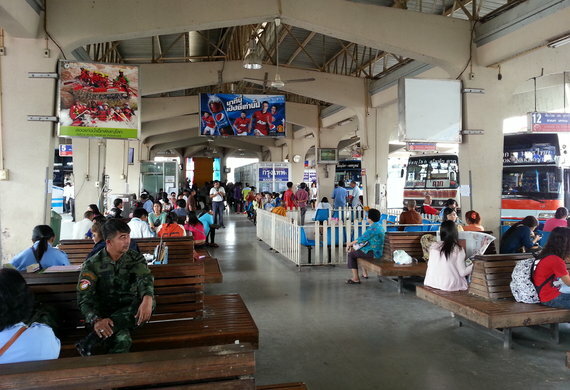 Need train for 2 routes: Phitsanulok to Lop Buri & Ayutthaya to Hua Hin. 5. From Hua Hin back to Don Muang airport, can I use this way: Airport bus from Hua Hin center to Suvarnabhumi Airport then free bus from there to Don Muang? I return Vietnam from Don Muang airport. Or it is easier to catch bus from Hua Hin to Bankok bus station and then bus / train to the Don Muang airport. 6. Do you have update info of date for Loi Krathong in Chiang Mai for local people and for international tourists? For the local is often some weeks or even a month before right? Is it correct it will be on 25 Nov in Chiang Mai (for international tourists)? Are there way to join or see from distance in case I cannot buy the ticket (often fully booked or too expensive)? 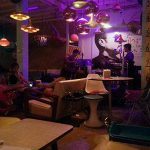 Hi, I’m planning a trip to Thailand and found this post very helpful! Do you know if there is a way to get bus + train timetables online? Or is it pretty easy to just show up at the station and buy tickets? Hi Sher, yes you can find the train timetable online here. No need to pre book the ticket unless you are traveling during big festivals like Songkran, Mothers Day, Fathers Day or New Year. Hi Lolo, I meant 1st of January. However you are right, Chinese New Year is also a popular travel time of the year.